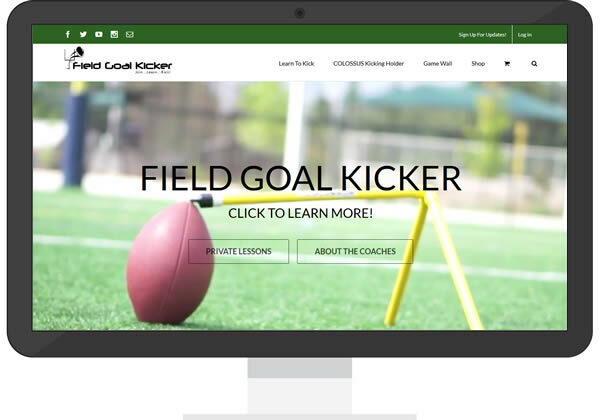 Field Goal Kicker Online (or FGK), is an online video based membership website that teaches kickers how to kick and punt. The site was created around an initial 60+ videos and content teaching the fundamentals of how to kick field goals. The site contains well over 100 pages of blog content as well as video and content pages for members. We built FGK using WordPress because it allows the coaches to update the site on a regular basis. Coaches can manage ongoing access to paid members for access to video instruction. They also sell the Colossus Football Kicking Holder product online, which was developed in mid 2014. The proprietary design has now sold all over the United States through the end of 2017 and the current yellow design/color has become a regularly shipped product from the site. FGK’s e-commerce website also sells kicker/punter image based performance shirts and other branded equipment in this niche market. This massive website was updated in 2016 with responsive design for mobile, new event calendar capabilities for kicking clinic schedules, a new forum for members as well as a full e-commerce store for kicking equipment and more. Sisson Media is a huge asset. They enable Cover Ups to make sound decisions involving our internet marketing and give recommendations on website development. Very professional and knowledgeable. We consider Sisson Media one of our most reliable vendors. They are easy to work with, and they always produce consistent, high quality results. Scott has consistently provided superlative work in a very expedient manner, not only in the design and implementation of the web site, but also in making sure that my site can be easily found on all major search engines. The service has been fantastic and our revenue growth has been well over 200% in our second year and expected to double that in our third year… We have been impressed with their ability to meet our needs and consistently deliver superior quality with the professionalism and record results… We are huge fans of the Sisson team!